A self-described scientist has filed a lawsuit alleging NASA is failing to properly investigate alien life. Rhawn Joseph, who’s written several books on extraterrestrial activity, wants the space agency to further analyze a strange rock on Mars, which he believes is proof of Martian activity. The author claims researchers have not properly analyzed the stone, which somehow appeared in front of the Opportunity rover last week. 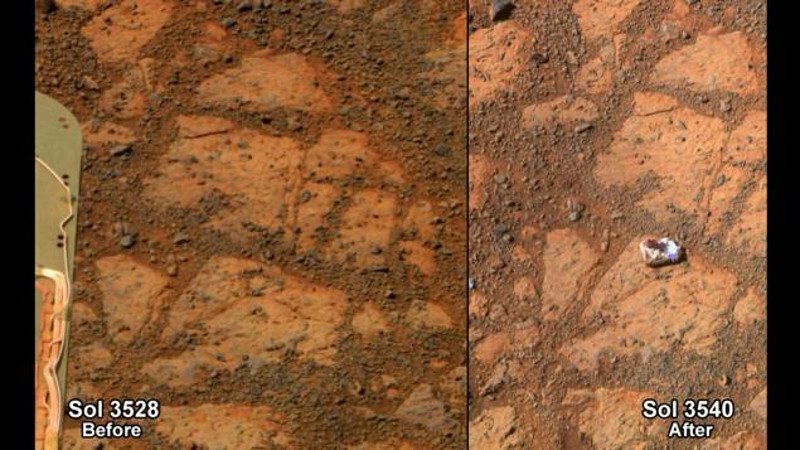 The jelly doughnut-shaped rock initially baffled scientists after it mysteriously showed up in images taken less than two weeks apart. It’s now believed it was simply knocked out of the ground by the planetary explorer. But Joseph, a key writer with the online Journal of Cosmology, says the rock is “a living thing” and has now filed a lawsuit in a California court to make NASA examine it more closely. Joseph claims the rock was there the whole time, but that it just grew before it became visible. “The refusal to take close up photos from various angles … to take microscopic images of the specimen … to release high resolution photos, is inexplicable, recklessly negligent, and bizarre,” his suit adds. Joseph now wants Bolden and his rover team to take 100 high resolution close-up in focus photos of the rock from all sides under appropriate lighting conditions with minimum glare. He also wants to see 24 microscopic, in-focus images of the exterior, lip, walls and interior of the specimen under appropriate lighting conditions. And, finally, he wants the rover team to make all of the pictures available to him so he can analyze them himself. NASA has yet to comment on the suit.